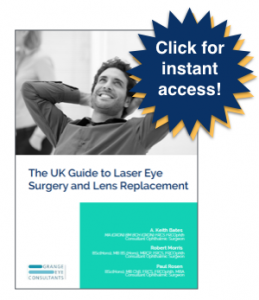 Patients are often concerned: will laser eye surgery harm their vision. Is there a risk of going blind? And in reality, there isn’t a risk of going blind with modern technology. Years ago, when laser eye surgery was in its infancy and the technology wasn’t as good, we didn’t perform the same diagnostic tests and we didn’t understand it as well as we do now, bearing in mind that a hundred million or so laser eye surgeries have been done worldwide, we really understand what’s going on. There are of course risks because every surgical procedure carries a risk. The most serious that could happen would be an infection. I’ve been doing laser eye surgery for 20 years and I’ve never seen an infection, although they do happen. In contrast, I’ve seen 100 of contact lens wearers with infections. So the risk of infection at laser eye surgery is much less than the risk of infection if you wear contact lenses. The cases of infection that have been reported have typically been in people who are healthcare workers exposed to unusual germs or vets or farm workers who are exposed to unusual infections. It’s therefore very important in that group of patients to ensure that they are not at any risk and they are very careful, both, before and after the procedure. Another risk of laser eye surgery that people were concerned about was something called ectasia. And this is an eccentricity in the cornea developing. Since we have better diagnostic tools we can better predict which patients are at risks of that. So the incense vector has fallen enormously because we are in such a good position to predict that risk, which we weren’t when we were doing diagnostics twenty years or so ago.